Just had to share with you the latest ebook released by Ella Publishing Co. 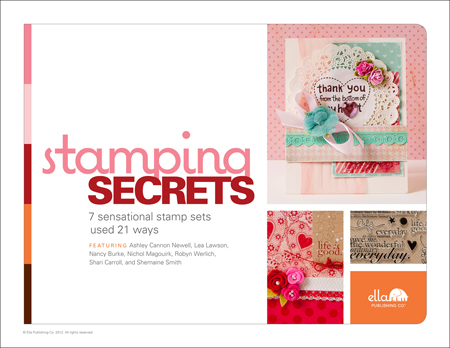 If you're into stamping, or if you'd like to learn more about it, then you really need to check out Stamping Secrets: 7 sensational stamp sets used 21 ways. In 28 packed pages, you'll enjoy 21 gorgeous projects, 35 expert stamping tips, 6 step-by-step written tutorials, and 20 minutes of exclusive video instruction—regularly priced at $10.99, but on sale for $8.79 (20% off) until March 7th!! - share their expert stamping tips, tricks, and tutorials with you!